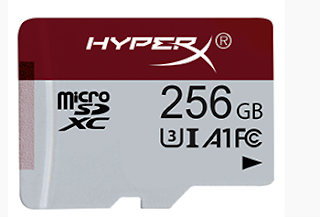 Kingston Digital introduced a line of High Endurance microSD cards designed for write-intensive application use such as home security and surveillance cameras, dash cams and body cams. Kingston said its High Endurance microSD cards are engineered and tested for use in harsh conditions and are durable enough to protect from extreme temperatures, shock, water and x-rays. Kingston’s High Endurance microSD cards are available in 32GB, 64GB and 128GB capacities. 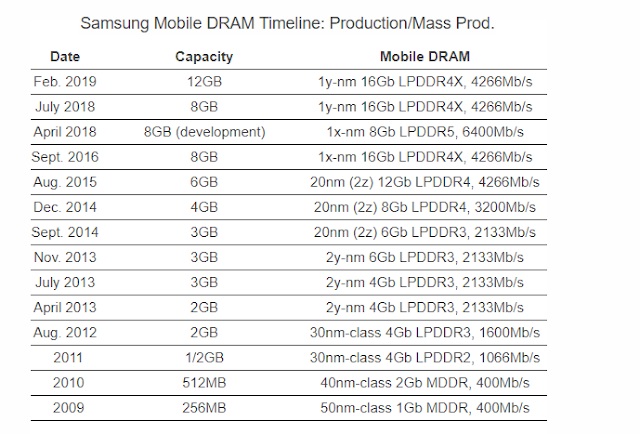 Samsung Electronics Co. announced mass production of the industry’s first 12-gigabyte (GB) low-power double data rate 4X (LPDDR4X) package -- the highest-capacity mobile DRAM to date. The 12GB capacity was achieved by combining six 16-gigabit (Gb) LPDDR4X chips based on the second-generation 10nm-class (1y-nm) process into a single package. The new 12GB mobile memory delivers a data transfer rate of 34.1GB per second while minimizing the increase in power consumption inevitably caused by a boost in DRAM capacity. 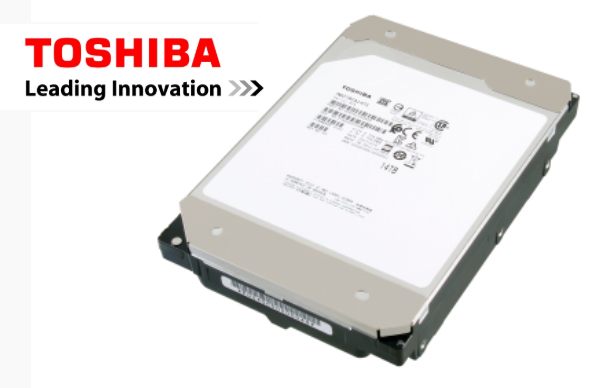 Toshiba Electronic Devices & Storage introduced a 16TB Conventional Magnetic Recording (CMR) HDD -- a new industry record, according to the company, and 14% more capacity than prior 14TB models. The drive is optimized for mixed random and sequential read and write workloads in both cloud and traditional data center environments. The MG08 Series is Toshiba’s second-generation helium-sealed HDD family, and eighth-generation Enterprise Capacity HDD family. It uses a 9-disk helium design and features 7,200rpm performance, a 550TB per year workload rating, a 2.5 million-hour MTTF, a 512Mib cache buffer, and a choice of SATA and SAS interfaces—all in an industry-standard, 3.5-inch form factor. Toshiba Memory introduced an native NVMe over Fabrics (NVMe-oF) SSD for direct Ethernet access based on the NVMe-oF Specification Version 1.0. Toshiba Memory's new SSD is powered by the Marvell 88SN2400 NVMe-oF SSD converter controller, enabling dual-port 25Gbps Ethernet connectivity of high-performance U.2 NVMe SSDs. This makes it suitable for cloud data centers and enterprise data centers. At this week's Flash Memory Summit in Santa Clara, California, Toshiba Memory is showing an Ethernet JBOF prototype chassis that was developed and built by Aupera Technologies. The JBOF is powered by 1+1 redundant 100Gbit Ethernet switch units with dual 6x100 Gbit Ethernet uplinks, which enables 16M IOPS system performance (4KB Random Read), the fastest ever seen in the industry. Samsung Electronics is ready to begin mass production of the first 10-nm class 8-gigabit LPDDR5 DRAM for use in upcoming 5G and Artificial Intelligence (AI)-powered mobile applications including smartphones and automobiles. The 10nm-class LPDDR5 DRAM will be available in two bandwidths – 6,400Mb/s at a 1.1 operating voltage (V) and 5,500Mb/s at 1.05V. The new memory incorporates a number of innovations including to lower its voltage in accordance with the operating speed of the corresponding application processor, when in active mode. There is also a deep sleep mode which cuts power to approximately half of the idle mode. Samsung estimates power savings of up to 30% over the previous generation. Toshiba Electronic Devices & Storage Corp. announced 14TB and 12TB HDD SATA models for data center storage. The drives have been qualified for installation on select Supermicro storage servers. Google Cloud Platform (GCP) announced a new high-performance storage service for users who need to create, read and write large files with low latency. The new Cloud Filestore is managed file storage for applications that require a file system interface and a shared file system. It gives users a simple, integrated, native experience for standing up fully managed network-attached storage (NAS) with their Google Compute Engine and Kubernetes Engine instances. Two tiers are offered. A high-performance Premium tier is $0.30 per GB per month, and the midrange performance Standard tier is $0.20 per GB per month in us-east1, us-central1, and us-west1 (Other regions vary). The next generation of SD Express memory cards will use the well-known PCIe 3.0 specification and NVMe v1.3 protocols defined by PCI-SIG and NVM Express, respectively. The PCIe interface delivering a 985 megabytes per second (MB/s) maximum data transfer rate and the NVMe upper layer protocol enables advanced memory access mechanism, enabling a new world of opportunities for the popular SD memory card. In addition, the maximum storage capacity in SD memory cards grows from 2TB with SDXC to 128 TB with the new SD Ultra Capacity (SDUC) card. These innovations maintain the SDA’s commitment to backward compatibility and are part of the new SD 7.0 specification. -Samsung Electronics launched the industry’s highest capacity NVMe solid state drive (SSD) based on Next-generation Small Form Factor – an eight-terabyte (TB) NF1 SSD. The new 8TB NVMe NF1 SSD has been optimized for data-intensive analytics and virtualization applications in next-generation data centers and enterprise server systems. Samsung said its new SSD is built with 16 of Samsung’s 512-gigabyte (GB) NAND packages, each stacked in 16 layers of 256 gigabit (Gb) 3-bit V-NAND chips, achieving an 8TB density in an ultra-small footprint of 11cm x 3.05cm. This is twice the capacity offered by the M.2 NVMe SSD (11cm x 2.2cm) commonly used in hyper-scale server designs and ultra-slim laptops. Toshiba introduced a new category of SAS SSDs to replace SATA SSDs in servers. 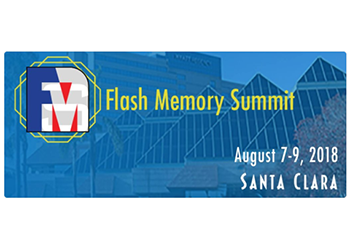 The RM5 12Gbit/s value SAS (vSAS) series feature Toshiba's BiCS FLASH TLC (3-bit-per-cell) 3D flash memory and will initially be available in capacities up to 7.68TB in a 2.5” form factor. Toshiba said the new drives offer capacity, performance, reliability, manageability and data security advantages – at a price that obsoletes SATA SSDs. Western Digital introduced its new 14TB Ultrastar DC HC530 hard drive -- the highest capacity hard drive based on CMR (conventional magnetic recording) technology. The new drive, which is based on the company's fifth-generation HelioSeal technology, is designed for public and private cloud data centers where storage density, watt/TB and $/TB are critical parameters for creating the most cost-efficient infrastructure. It is available with either 12Gb/s SAS or 6Gb/s SATA interface. WD already offers 14TB SMR (shingled magnetic recording) drive. The company noted that Tencent, a leading global Internet service provider based in China is adopting Western Digital’s HelioSeal-based hard drives for their Tencent Cloud data centers. The single-sided M.2 2280 (22mm x 80mm) form factor makes SSD features a Gen 3.0 x2 interface, 4-channel Phison 5008 controller, and 3D NAND Flash. It delivers 2x the performance of SATA SSDs with read/write speeds up to 1500MB/s and 1000MB/s. Seagate Technology introduced its 14TB helium-based Exos X14 enterprise drive at the OCP U.S. Summit 2018 in San Jose, California. 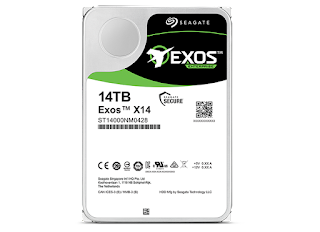 The Seagate Exos X14, which is aimed at hyperscale data centers, boasts enhanced areal density for higher capacity storage in a smaller package. It offers built-in encryption with the United States government’s Federal Information Processing Standard (FIPS) 140-2, Level 2 certification and the Common Criteria for Information Technology Security Evaluation (CC) - an international computer security certification standard (ISO/EIC 15408). Other key features include 40 percent more petabytes per rack versus Exos 10TB drives, a 10 percent weight reduction versus air nearline drives, and a flexible design that delivers wider integration options and support for a greater number of workloads. 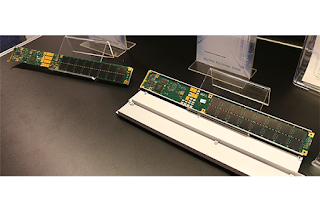 Toshiba announced its latest line-up of NVM Express (NVMe) and SATA data center solid-state drives (SSDs) based on its 64-layer 3-bit-per-cell TLC (triple-level cell) BiCS FLASH 3D flash memory. The drives feature controllers designed and developed in-house. The two PCIe® NVMe SSDs are designed to accommodate multiple data center workload profiles, with capacities ranging from 960GB to 7.68TB in a 2.5-inch form factor. These drives deliver up to 500,000 IOPS random read, up to 35,000 IOPS random write, up to 3,140MB/s sequential read, and up to 1,980MB/s sequential write performance within a 9-14W power envelope. The XD5 Series is a small-footprint M.2 22110 form factor SSD that supports capacities up to 3.84TB and delivers up to 2,600 MB/s sequential read and up to 890MB/s sequential write performance in a 7W power envelope. 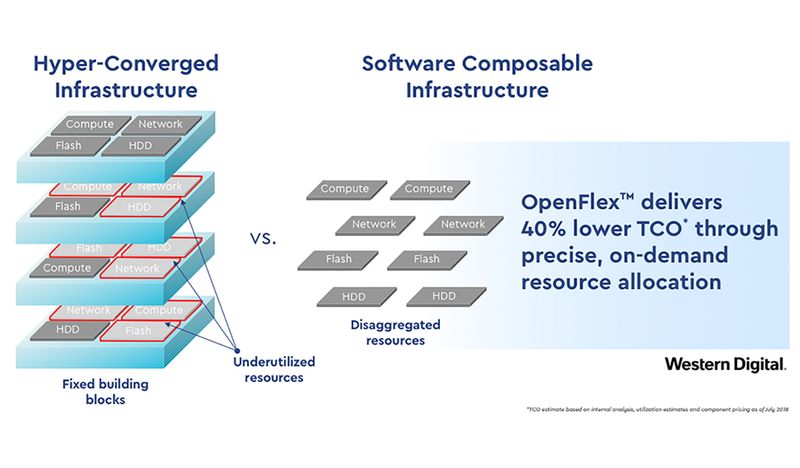 All three series are optimized for low latency and performance consistency in read-intensive workloads, for Open Compute Project (OCP) and hyper-scale/cloud applications.